I’ve GOT NOTHING to Wear!!! Does the phrase ‘I’ve got nothing to wear’ sound familiar? 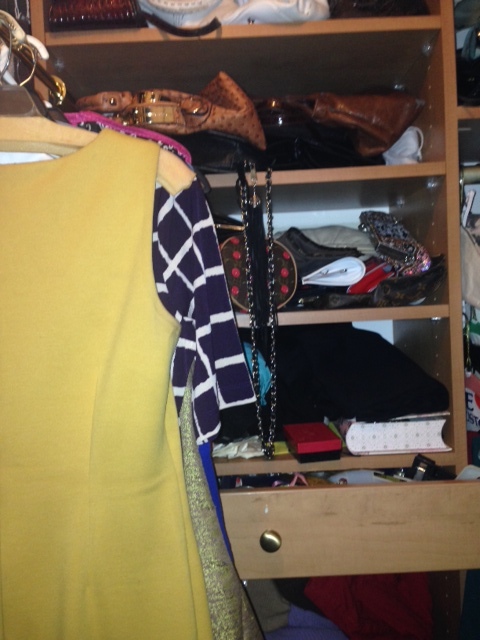 Often we are saying it with our hands up in the air staring at this– our full closets. I have a confession to make. Come closer- don’t tell anyone- but that is MY closet. One of them. Usually it is not that messy, but I was looking for something to wear! But what if I gave you a whole new wardrobe. Well technically it is a whole new outlook on your old wardrobe in a brand new way. It is a Closet Rejuvenation. Fascinating! The term coined by my new friend Diane Pollack- who says we StyleStars are missing fashion opportunities staring us right in the face. 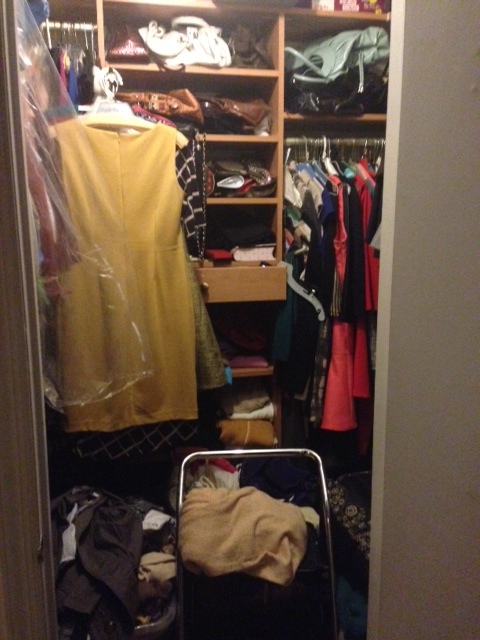 Diane says Closet Rejuvenation is a closet overhaul or closet audit. 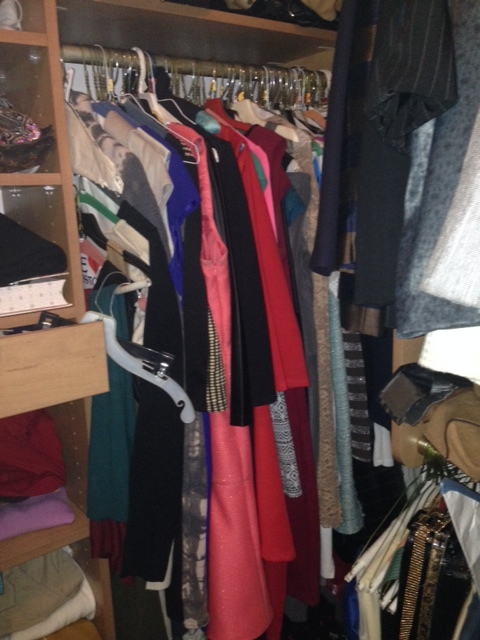 So naturally I’m thinking a closet organizer-believe it or not California Closet has been here. “I come to my clients home and recreate a wardrobe out of what they do have. The first thing we do is get rid of old, outdated, ill fitting, or damaged clothes. These items are just creating clutter. Then I create outfits out of what they do have; outfits that they had not thought to wear together. The finishing touches on an outfit, taking it from fine to fabulous are the accessories. The right shoes are key. I also help accessorize a finishing piece of jewelry, bag or scarf etc. Then we take pictures. This makes it a no brainier when a women is rushed in the morning, she does not a have to think about her outfit and knows which pieces really work well together. Wow! Imagaine that. Months ago I wrote a post for you StyleStars about shopping in your closet. Somethng I have done before when I “discovered” a dress that I haven’t worn in forever. But this is different. Even on a budget (which as you know is the number one rule of a StyleStar)- you can update with accessories. I asked Diane what if I find something in my closet I haven’t worn in two years. (I hate when people say throw it out- No! I may wear it again even if it is years later.) Diane says “This generally still holds true. If nothing else, the item should certainly be re-assessed with a keen eye.There are a few exceptions. Perhaps the item hasn’t been worn because the woman doesn’t have the proper item to make a great outfit. In that case, she should keep it and I advise what would look best with it. I also allow women to keep an item or two of sentimental value”. Now wrap your head around this StyleStars- Diane believes you actually create a larger wardrobe by following her tips. AND speaking of tips- you know the best way to fit more clothes neatly in a small closet- Diane suggests getting thin hangers and hang all your clothes on the same type of hangers. You can fit in more clothes.. yes I know- great idea. Oh do separate your seasons. Why have the sundress next to the sweater dress. And hang like items together. If Diane had a dime for every time she says she saw pants hanging next to a jacket- well those dimes would add up for enough to buy a new wardrobe. But again who needs it– when you can rejuvenate the one you already have. Her company is Stylempower http://www.stylempower.com. She can be emailed at diane@stylempower.com and contacted at 646 831 2584.
on Facebook, Instagaram, twitter or Pinterest, all under Stylempower.